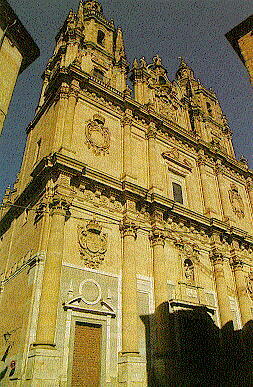 This monument following the baroque style was constructed beginning in 1,617 by order of King Philip III and his wife Queen Marguerite of Austria, under the direction of the architect Juan Gómez de Mora, and succeeded by several technicians throughout the 150 years that the construction took. Its façade cannot be wholly appreciated in its magnitude by a frontal view. In its interior should noted the church and its boards, its baroque patio in the following picture and other diverse sculptures. 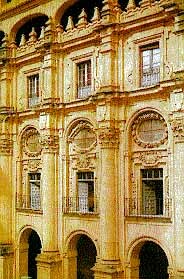 It was and is a Jesuit school, which today also houses the Pontifical University . The Church, its great dome , the boards and its cloister are the elements are most interesting.